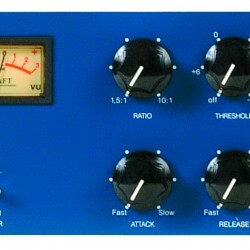 The TUBE-TECH CL2A Dual Compressor features two independent optical compressors. The optical gain reduction element is placed after the input transformer and then followed by an all tube-based output amplifier with a +10 dB gain. A switch with three positions (Link 1, Off, Link 2) is used whenever you want to use the two separate compressors in stereo mode or link several compressors together. The two link busses are identical. Both Input and Output are balanced and have fully floating transformers with a static screen. The power supply and the sidechain circuit is based on a solid state circuit. With the exception of the anode voltage for the output stage all DC voltages are stabilized. Net: 5.8 kg 12.8 lbs. Shipping: 7.1 kg 15.6 lbs.